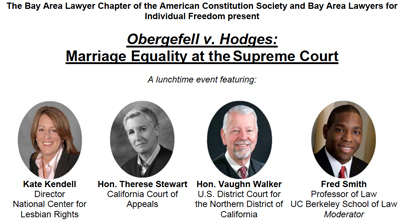 The American Constitution Society and BALIF invite you to join our all-star panel of marriage equality experts for a discussion of the Supreme Court's pending marriage equality cases consolidated into Obergefell v. Hodges..
On the panel are three of the most distinguished names in the history of marriage equality both in California and on the national stage. Kate Kendell is the leader of the National Center for Lesbian Rights, a relentless advocate for the rights of LGBT people that regularly brings cases on behalf of LGBT plaintiffs all across the country, including Tanco v. Haslam, one of the four marriage equality cases currently before the U.S. Supreme Court. The Honorable Therese Stewart is the former Chief Deputy City Attorney for San Francisco who represented the City and County of San Francisco in securing a ruling in favor of marriage equality in In re Marriage Cases in the California Supreme Court before Prop. 8, and argued before the U.S. District Court for the Northern District of California and the Ninth Circuit Court of Appeals that Prop. 8 was unconstitutional. In 2013, her groundbreaking work led to the U.S. Supreme Court's historic decision to overturn the Defense of Marriage Act. Chief Judge Vaughn R. Walker, who presided over the Prop. 8 case while serving on the U.S. District Court for the Northern District of California, was one of the first judges in the country to rule that marriage equality was a constitutional right, a decision that has served as the backbone of the more than 60 marriage quality decisions decided since and leading up to the cases now before the Supreme Court. The discussion will be moderated by Berkeley Law Professor Fred Smith. RSVP required to get into the building for the panel.